The Wall Street Journal is a U.S. business-focused, English-language international daily newspaper based in New York City. The Journal, along with its Asian and European editions, is published six days a week by Dow Jones & Company, a division of News Corp. The newspaper is published in the broadsheet format and online. The Journal has been printed continuously since its inception on July 8, 1889, by Charles Dow, Edward Jones, and Charles Bergstresser. 1211 Avenue of the Americas, New York City, U.S. The Wall Street Journal is one of the largest newspapers in the United States by circulation, with a circulation of about 2.475 million copies (including nearly 1,590,000 digital subscriptions) as of June 2018[update], compared with USA Today's 1.7 million. The Journal publishes the luxury news and lifestyle magazine WSJ, which was originally launched as a quarterly but expanded to 12 issues as of 2014. An online version was launched in 1996, which has been accessible only to subscribers since it began. The newspaper is notable for its award-winning news coverage, and has won 37 Pulitzer Prizes (as of 2019). The editorial pages of the Journal are typically conservative in their position. The first products of Dow Jones & Company, the publisher of the Journal, were brief news bulletins, nicknamed "flimsies", hand-delivered throughout the day to traders at the stock exchange in the early 1880s. They were later aggregated in a printed daily summary called the Customers' Afternoon Letter. 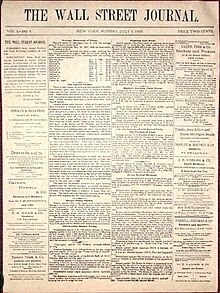 Reporters Charles Dow, Edward Jones, and Charles Bergstresser converted this into The Wall Street Journal, which was published for the first time on July 8, 1889, and began delivery of the Dow Jones News Service via telegraph. In 1896, The "Dow Jones Industrial Average" was officially launched. It was the first of several indices of stock and bond prices on the New York Stock Exchange. In 1899, the Journal's Review & Outlook column, which still runs today, appeared for the first time, initially written by Charles Dow. Journalist Clarence Barron purchased control of the company for US$130,000 in 1902; circulation was then around 7,000 but climbed to 50,000 by the end of the 1920s. Barron and his predecessors were credited with creating an atmosphere of fearless, independent financial reporting—a novelty in the early days of business journalism. In 1921, Barron's, the United States's premier financial weekly, was founded. Barron died in 1928, a year before Black Tuesday, the stock market crash that greatly affected the Great Depression in the United States. Barron's descendants, the Bancroft family, would continue to control the company until 2007. The Journal took its modern shape and prominence in the 1940s, a time of industrial expansion for the United States and its financial institutions in New York. Bernard Kilgore was named managing editor of the paper in 1941, and company CEO in 1945, eventually compiling a 25-year career as the head of the Journal. Kilgore was the architect of the paper's iconic front-page design, with its "What's News" digest, and its national distribution strategy, which brought the paper's circulation from 33,000 in 1941 to 1.1 million at the time of Kilgore's death in 1967. Under Kilgore, in 1947, the paper won its first Pulitzer Prize for William Henry Grimes's editorials. 1971 to 1997 brought about a series of launches, acquisitions, and joint ventures, including "Factiva", The Wall Street Journal Asia, The Wall Street Journal Europe, the WSJ.com website, Dow Jones Indexes, MarketWatch, and "WSJ Weekend Edition". In 2007, News Corp. acquired Dow Jones. WSJ., a luxury lifestyle magazine, was launched in 2008. A complement to the print newspaper, The Wall Street Journal Online, was launched in 1996 and has allowed access only by subscription from the beginning. In 2003, Dow Jones began to integrate reporting of the Journal's print and online subscribers together in Audit Bureau of Circulations statements. In 2007, it was commonly believed to be the largest paid-subscription news site on the Web, with 980,000 paid subscribers. Since then, digital subscription has risen to 1.3 million as of September 2018, falling to number two behind the New York Times with 3 million digital subscriptions. In May 2008, an annual subscription to the online edition of The Wall Street Journal cost $119 for those who do not have subscriptions to the print edition. By June 2013, the monthly cost for a subscription to the online edition was $22.99, or $275.88 annually, excluding introductory offers. Digital subscription rates increased dramatically as its popularity increased over print to $443.88 per year, with first time subscribers paying $187.20 per year. On November 30, 2004, Oasys Mobile and The Wall Street Journal released an app that would allow users to access content from the Wall Street Journal Online via their mobile phones. Many of The Wall Street Journal news stories are available through free online newspapers that subscribe to the Dow Jones syndicate. Pulitzer Prize–winning stories from 1995 are available free on the Pulitzer web site. On September 5, 2006, the Journal included advertising on its front page for the first time. This followed the introduction of front-page advertising on the European and Asian editions in late 2005. After presenting nearly identical front-page layouts for half a century—always six columns, with the day's top stories in the first and sixth columns, "What's News" digest in the second and third, the "A-hed" feature story in the fourth (with 'hed' being jargon for headline) and themed weekly reports in the fifth column – the paper in 2007 decreased its broadsheet width from 15 to 12 inches while keeping the length at 22​3⁄4 inches, to save newsprint costs. News design consultant Mario Garcia collaborated on the changes. Dow Jones said it would save US$18 million a year in newsprint costs across all The Wall Street Journal papers. This move eliminated one column of print, pushing the "A-hed" out of its traditional location (though the paper now usually includes a quirky feature story on the right side of the front page, sandwiched among the lead stories). The paper still[when?] uses ink dot drawings called hedcuts, introduced in 1979 and originally created by Kevin Sprouls, in addition to photographs, a method of illustration considered a consistent visual signature of the paper. The Journal still heavily employs the use of caricatures, notably those of Ken Fallin, such as when Peggy Noonan memorialized then-recently deceased newsman Tim Russert. The use of color photographs and graphics has become increasingly common in recent years with the addition of more "lifestyle" sections. A special committee was established to oversee the paper's editorial integrity. When the managing editor Marcus Brauchli resigned on April 22, 2008, the committee said that News Corporation had violated its agreement by not notifying the committee earlier. However, Brauchli said he believed that new owners should appoint their own editor. In 2011, The Guardian found evidence that the Journal had artificially inflated its European sales numbers, by paying Executive Learning Partnership for purchasing 16% of European sales. These inflated sales numbers then enabled the Journal to charge similarly inflated advertising rates, as the advertisers would think that they reached more readers than they actually did. In addition, the Journal agreed to run "articles" featuring Executive Learning Partnership, presented as news, but effectively advertising. The case came to light after a Belgian Wall Street Journal employee, Gert Van Mol, informed Dow Jones CEO Les Hinton about the questionable practice. As a result, the then Wall Street Journal Europe CEO and Publisher Andrew Langhoff was fired after it was found out he personally pressured journalists into covering one of the newspaper's business partners involved in the issue. Since September 2011 all the online articles that resulted from the ethical wrongdoing carry a Wall Street Journal disclaimer informing the readers about the circumstances in which they were created. The Journal, along with its parent Dow Jones & Company, was among the businesses News Corporation spun off in 2013 as the new News Corp. In November 2016, in an effort to cut costs, the Journal's editor-in-chief, Gerard Baker, announced that layoffs and consolidation to its sections would take place. In the memo, the new format for the newspaper will have a "Business & Finance" section that will combine its current "Business & Tech" and "Money & Investing" sections. It will also include a new "Life & Arts" section that will combine its current "Personal Journal" and "Arena" sections. In addition, the current "Greater New York" coverage will be reduced and will move into the main section of paper. WSJ Live became available on mobile devices in September 2011. "Greater New York", a stand-alone, full color section dedicated to the New York metro area, launched April 2010. The Wall Street Journal's San Francisco Bay Area Edition, which focuses on local news and events, launched on November 5, 2009, appearing locally each Thursday in the print Journal and every day on online at WSJ.com/SF. Launch of The Wall Street Journal Sunday: September 12, 1999. A four-page print supplement of original investing news, market reports and personal-finance advice that ran in the business sections of other U.S. newspapers. WSJ Sunday circulation peaked in 2005 with 84 newspapers reaching nearly 11 million homes. The publication ceased on February 7, 2015. Since 1980, the Journal has been published in multiple sections. At one time, The Journal's page count averaged as much as 96 pages an issue, but with the industry-wide decline in advertising, the Journal in 2009–10 more typically published about 50 to 60 pages per issue. As of 2012[update], The Wall Street Journal had a global news staff of around 2,000 journalists in 85 news bureaus across 51 countries. As of 2012[update], it had 26 printing plants. In addition to these regular opinion pieces, on Fridays the Journal publishes a religion-themed op-ed, titled "Houses of Worship", written by a different author each week. Authors range from the Dalai Lama to cardinals. WSJ. is The Wall Street Journal's luxury lifestyle magazine. Its coverage spans art, fashion, entertainment, design, food, architecture, travel and more. Kristina O'Neill is Editor in Chief and Anthony Cenname is Publisher. The Journal won its first two Pulitzer Prizes for editorial writing in 1947 and 1953. Subsequent Pulitzer Prizes have been awarded for editorial writing to Robert L. Bartley in 1980 and Joseph Rago in 2011; for criticism to Manuela Hoelterhoff in 1983 and Joe Morgenstern in 2005; and for commentary to Vermont Royster in 1984, Paul Gigot in 2000, Dorothy Rabinowitz in 2001, Bret Stephens in 2013, and Peggy Noonan in 2017. Each Thanksgiving the editorial page prints two famous articles that have appeared there since 1961. The first is titled The Desolate Wilderness, and describes what the Pilgrims saw when they arrived at the Plymouth Colony. The second is titled And the Fair Land, and describes the bounty of America. It was written by a former editor, Vermont C. Royster, whose Christmas article In Hoc Anno Domini has appeared every December 25 since 1949. On September 12, 2018, the Census Bureau released data showing improvement in household income and the poverty rate during 2017, Trump's first year in office. The Journal published an editorial that day attributing the improvement to Trump's purportedly superior economic policies, compared to Obama's. However, The Journal's news division reported that both figures also showed improvement in 2015 and 2016, and they improved to a greater degree in both those years than they did in 2017. The Journal's editorial pages and columns, run separately from the news pages, have a conservative bent and are highly influential in American conservative circles. As editors of the editorial page, Vermont C. Royster (served 1958–1971) and Robert L. Bartley (served 1972–2000) were especially influential in providing a conservative interpretation of the news on a daily basis. Some of the Journal's former reporters claim that the paper has adopted a more conservative tone since Rupert Murdoch's purchase. The editorial board has long argued for a pro-business immigration policy. In a July 3, 1984, editorial, the board wrote: "If Washington still wants to 'do something' about immigration, we propose a five-word constitutional amendment: There shall be open borders." This stand on immigration reform places the Journal in contrast to most conservative activists, politicians, and media publications for example National Review and The Washington Times, who favor heightened restrictions on immigration. The Journal's editorial page has been seen as critical of many aspects of Barack Obama's presidency. In particular, it has been a prominent critic of the Affordable Care Act legislation passed in 2010, and has featured many opinion columns attacking various aspects of the bill. The Journal's editorial page has also criticized the Obama administration's energy policies and foreign policy. On October 25, 2017, the editorial board called for Special Counsel Robert Mueller to resign from the investigation into Russian interference in the 2016 United States elections and accused Hillary Clinton's 2016 presidential campaign of colluding with Russia. In December 2017, the editorial board repeated its calls for Mueller's resignation. The editorials by the editorial board caused fractures within the Wall Street Journal, as reporters say that the editorials undermine the paper's credibility. The Journal editorial board has promoted fringe views on scientific matters, including climate change, acid rain, and ozone depletion, as well as on the health harms of second-hand smoke, pesticides and asbestos. Scholars have drawn similarities between the Journal's fringe coverage of climate change and how it used to reject the settled science on acid rain and ozone depletion. The editorial board of The Wall Street Journal rejects the scientific consensus on climate change. The Journal disputes that it poses a major threat to human existence and can be prevented through public policy. The Journal has published articles disputing that global warming is occurring at all. The Journal is regarded as a forum for climate change skeptics, publishing articles by individuals skeptical of the consensus position on climate change in its op-ed section. These columns frequently attack climate scientists and accuse them of engaging in fraud. A 2015 study found The Wall Street Journal was the newspaper that was least likely to present negative effects of global warming among several newspapers. It was also the most likely to present negative economic framing when discussing climate change mitigation policies, tending to taking the stance that the cost of such policies generally outweighs their benefit. Climate Feedback, a fact-checking website on media coverage of climate science, has assessed that multiple opinion articles range between "low" and "very low" in terms of scientific credibility. The Journal has been accused of refusing to publish opinions of scientists which present the mainstream view on climate change. According to a 2016 analysis, 14% of the guest editorials presented the results of "mainstream climate science", while the majority did not. Also, none of 201 editorials published in the WSJ since 1997 concede that the burning of fossil fuels was causing climate change. In the 1980s and 1990s, the Journal published numerous columns disputing and misrepresenting the science behind acid rain and the scientific consensus behind the causes of ozone depletion and the health harms of second-hand smoke, and opposed public policy efforts to curb acid rain, ozone depletion and second-hand smoke. The Journal has also published columns attacking efforts to control pesticides and asbestos. By the 2000s, the Journal editorial board recognized that efforts to curb acid rain through cap-and-trade had been successful. The Journal's editors stress the independence and impartiality of their reporters. According to CNN in 2007, the Journal's "newsroom staff has a reputation for non-partisan reporting." In a 2004 study, Tim Groseclose and Jeff Milyo argue the Journal's news pages have a pro-liberal bias because they more often quote liberal think tanks. They calculated the ideological attitude of news reports in 20 media outlets by counting the frequency they cited particular think tanks and comparing that to the frequency that legislators cited the same think tanks. They found that the news reporting of The Journal was the most liberal (more liberal than NPR or The New York Times). The study did not factor in editorials. Mark Liberman criticized the model used to calculate bias in the study and argued that the model unequally affected liberals and conservatives and that "..the model starts with a very peculiar assumption about the relationship between political opinion and the choice of authorities to cite." [The authors assume that] "think tank ideology [...] only matters to liberals." The company's planned and eventual acquisition by News Corp in 2007 led to significant media criticism and discussion about whether the news pages would exhibit a rightward slant under Rupert Murdoch. An August 1 editorial responded to the questions by asserting that Murdoch intended to "maintain the values and integrity of the Journal." The Journal has won 37 Pulitzer Prizes in its history. Staff journalists who led some of the newspaper's best-known coverage teams have later published books that summarized and extended their reporting. In the 1980s, then Journal reporter James B. Stewart brought national attention to the illegal practice of insider trading. He was awarded the Pulitzer Prize in explanatory journalism in 1988, which he shared with Daniel Hertzberg, who went on to serve as the paper's senior deputy managing editor before resigning in 2009. Stewart expanded on this theme in his book, Den of Thieves. The Journal claims to have sent the first news report, on the Dow Jones wire, of a plane crashing into the World Trade Center on September 11, 2001. Its headquarters, at One World Financial Center, was severely damaged by the collapse of the World Trade Center just across the street. Top editors worried that they might miss publishing the first issue for the first time in the paper's 112-year history. They relocated to a makeshift office at an editor's home, while sending most of the staff to Dow Jones's South Brunswick, N.J., corporate campus, where the paper had established emergency editorial facilities soon after the 1993 World Trade Center bombing. The paper was on the stands the next day, albeit in scaled-down form. Perhaps the most compelling story in that day's edition was a first-hand account of the Twin Towers' collapse written by then-Foreign Editor John Bussey, who holed up in a ninth-floor Journal office, literally in the shadow of the towers, from where he phoned in live reports to CNBC as the towers burned. He narrowly escaped serious injury when the first tower collapsed, shattering all the windows in the Journal's offices and filling them with dust and debris. The Journal won a 2002 Pulitzer Prize in Breaking News Reporting for that day's stories. The Journal subsequently conducted a worldwide investigation of the causes and significance of 9/11, using contacts it had developed while covering business in the Arab world. In Kabul, Afghanistan, a reporter from The Wall Street Journal bought a pair of looted computers that Al Qaeda leaders had used to plan assassinations, chemical and biological attacks, and mundane daily activities. The encrypted files were decrypted and translated. It was during this coverage that terrorists kidnapped and killed Journal reporter Daniel Pearl. A report published on September 30, 2010, detailing allegations McDonald's had plans to drop health coverage for hourly employees drew criticism from McDonald's as well as the Obama administration. The Wall Street Journal reported the plan to drop coverage stemmed from new health care requirements under the Patient Protection and Affordable Care Act. McDonald's called the report "speculative and misleading", stating they had no plans to drop coverage. The Wall Street Journal report and subsequent rebuttal received coverage from several other media outlets. In 2015, a report published by the Journal alleged that up to US$700 million was wired from 1MDB, a Malaysian state investment company, to the personal accounts of Malaysia Prime Minister Najib Razak at AmBank, the fifth largest lender in Malaysia. Razak responded by threatening to sue the New York-based newspaper. The report prompted some governmental agencies in Malaysia to conduct an investigation into the allegation. In 2015, a report written by the Journal's John Carreyrou alleged that blood testing company Theranos' technology was faulty and founder Elizabeth Holmes was misleading investors. According to Vanity Fair, "a damning report published in The Wall Street Journal had alleged that the company was, in effect, a sham—that its vaunted core technology was actually faulty and that Theranos administered almost all of its blood tests using competitors' equipment." The Journal has subsequently published several more reports questioning Theranos' and Holmes' credibility. On June 15, 2018, the U.S. Attorney for the Northern District of California announced the indictment of Holmes on wire fraud and conspiracy charges in relation to her role as CEO of Theranos. On January 12, 2018 Michael Rothfeld and Joe Palazzolo reported in the Wall Street Journal that during the [[2016 United States presidential election |2016 Presidential Campaign]] then candidate Donald Trump's personal lawyer, Michael Cohen coordinated a $130,000 payment to Stormy Daniels for her silence regarding an alleged affair. In subsequent reports, the method of payment and many other details were extensively covered. In April of that year, FBI agents stormed the home of Michael Cohen seizing records related to the transaction. In August 21, 2018, Cohen pleaded guilty to eight counts including campaign finance violations in connection with the Daniels payment. The coverage earned them the 2019 Pulitzer Prize in national reporting. ^ a b "Form 10-K June, 2018". SEC. Retrieved February 12, 2018. ^ Salwen, Michael B.; Garrison, Bruce; Driscoll, Paul D. (December 13, 2004). Online News and the Public. Routledge. ISBN 9781135616793. ^ "The Wall Street Journal". dowjones.com. Retrieved April 7, 2019. ^ "The Pulitzer Prizes – What's New". pulitzer.org. Archived from the original on February 24, 2008. Retrieved April 10, 2017. ^ Ember, Sydney (March 22, 2017). "Wall Street Journal Editorial Harshly Rebukes Trump" – via NYTimes.com. ^ Bowden, John (January 11, 2019). "Wall Street Journal editorial: Conservatives 'could live to regret' Trump emergency declaration". TheHill. ^ "Unpacking WSJ's 'watershed' Trump editorial". Columbia Journalism Review. ^ Dow Jones & Co. Inc., "Dow Jones History – The Late 1800s" Archived August 7, 2006, at the Wayback Machine, Retrieved July 25, 2013. ^ a b c d e Crossen, Cynthia. "It All Began in the Basement of a Candy Store Archived October 7, 2008, at the Wayback Machine", The Wall Street Journal (New York), p. B1, August 1, 2007. ^ "Dow Jones Local Media Group, Inc". Local Media Group. ^ Edgecliffe-Johnson, Andrew (September 3, 2008). "WSJ magazine targets upscale market". Financial Times. Archived from the original on September 29, 2011. ^ Stulberg, Ariel (May 23, 2017). "Testing news paywalls: Which are leaky, and which are airtight?". Columbia Journalism Review. ^ "The Wall Street Journal Announces New Integrated Print and Online Sales and Marketing Initiatives". Press release. November 3, 2003. ^ "Oasys Mobile, Inc. News Release". Phx.corporate. Archived from the original on February 20, 2012. Retrieved June 5, 2011. ^ "The Pulitzer Prizes – What's New". pulitzer.org. Archived from the original on March 9, 2008. ^ Mitchell, Bill. "The Wall Street Journal Weekend Edition: Expectations, Surprises, Disappointments Archived August 16, 2006, at the Wayback Machine". Poynter Online, September 21, 2005. ^ Wray, Richard (February 1, 2007). "How the word on Wall Street will spread around the world". The Guardian. UK. Archived from the original on February 3, 2007. Retrieved February 3, 2007. ^ "Punctuation Nerds Stopped by Obama Slogan, 'Forward.'". The Wall Street Journal. July 31, 2012. Archived from the original on October 30, 2012. Retrieved October 30, 2012. ^ "Wall Street Journal Introduces New Front Page Advertising Opportunity Archived August 14, 2006, at the Wayback Machine". Press release, July 18, 2006. Retrieved August 19, 2006. ^ WSJ.com Guided Tour: Page One, accessed August 30, 2007. ^ Ahrens, Frank (October 12, 2005). "Wall Street Journal To Narrow Its Pages". The Washington Post. Archived from the original on July 24, 2008. Retrieved August 19, 2006. ^ "Picturing Business in America" Archived November 5, 2005, at the Wayback Machine, Smithsonian National Portrait Gallery, Retrieved August 19, 2006. ^ Noonan, Peggy (June 20, 2008). "Tim Russert WSJ drawing". The Wall Street Journal. Archived from the original on September 26, 2011. Retrieved June 5, 2011. ^ Caricaturist Captures the Corporate Market Archived September 24, 2009, at the Wayback Machine, Biz Bash Orlando, August 11, 2008. ^ "World's Best-Designed winners (2006)". Society for News Design. February 23, 2011. Archived from the original on August 18, 2017. Retrieved October 8, 2013. ^ "Murdoch wins Control of Dow Jones". BBC. August 1, 2007. Archived from the original on August 5, 2007. Retrieved August 1, 2007. ^ "Murdoch clinches deal for publisher of Journal". MSNBC. August 1, 2007. Archived from the original on August 25, 2007. Retrieved August 9, 2007. ^ "News Corp Dow Jones Deal Done –". Portfolio.com. September 11, 2008. Archived from the original on May 11, 2011. Retrieved June 5, 2011. ^ a b L. Gordon Crovitz, "A Report to Our Readers". The Wall Street Journal (New York), page A14, August 1, 2007. ^ Steve Stecklow (April 30, 2008). "WSJ Editor's Resignation Is Criticized By Committee". The Wall Street Journal. Archived from the original on September 18, 2008. Retrieved September 27, 2008. ^ Steve Stecklow, Aaron O. Patrick, Martin Peers, and Andrew Higgins, "Calling the shots: In Murdoch's career, a hand in the news; his aggressive style can blur boundaries; 'Buck stops with me'" Archived December 13, 2007, at the Wayback Machine, Wall Street Journal, June 5, 2007. ^ Davies, Nick (October 12, 2011). "Wall Street Journal circulation scam claims senior Murdoch executive". The Guardian. London. Archived from the original on November 14, 2013. Retrieved October 13, 2011. ^ Staff, THR (October 12, 2011). "News Corp Ignored Wall Street Journal Circulation Inflation (Report)". The Hollywood Reporter. US. Archived from the original on April 11, 2012. Retrieved October 13, 2011. ^ Meyers, Steve (October 13, 2011). "WSJ Europe publisher resigns after reports he 'personally pressured' journalists into covering paper's business partner". US: Poynter Institute. Archived from the original on November 14, 2011. Retrieved October 13, 2011. ^ Sonne, Paul (October 12, 2011). "Publisher of WSJ Europe Resigns After Ethics Inquiry". The Wall Street Journal. London. Archived from the original on October 13, 2011. Retrieved October 13, 2011. ^ "Wall Street Journal Begins Layoffs, Cuts Sections". Forbes. New York. November 2, 2016. Archived from the original on November 4, 2016. Retrieved November 2, 2016. ^ "Wall Street Journal Adds to Live Video Programming". The New York Times. September 13, 2011. Archived from the original on August 4, 2014. ^ "Wall Street Journal Launches NY Section, Aiming To Compete With NY Times". Archived from the original on August 15, 2017. ^ "New York Main Page". Archived from the original on July 25, 2017. Retrieved August 15, 2017. ^ "Goodbye From The WSJ Sunday". February 8, 2015. Retrieved September 14, 2018 – via www.wsj.com. ^ "WSJ.com". online.wsj.com. Archived from the original on December 19, 2016. ^ a b "The Wall Street Journal" (PDF). Dow Jones & Company. January 2012. Archived from the original (PDF) on February 27, 2013. Retrieved July 25, 2013. ^ "Worldwide Bureaus". Dow Jones & Company. 2011. Archived from the original on August 20, 2011. Retrieved August 25, 2011. ^ "Opinion, Editorials, Columns, Op-Ed, Letters to the Editor, Commentary". The Wall Street Journal. Archived from the original on June 4, 2004. ^ Chukky Nze. "WSJ. Media Kit". The Wall Street Journal. Archived from the original on April 7, 2014. ^ "Check Out All of the Winners in the Print Category From This Year's Hot List". Adweek. Archived from the original on April 7, 2014. ^ Grimes, William H. (January 2, 1951). "A Newspaper's Philosophy". The Wall Street Journal. New York, NY. seen in "A Newspaper's Philosophy". Dow Jones & Company. 2007. Archived from the original on July 16, 2007. Retrieved August 26, 2011. ^ Naureckas, Jim; Rendall, Steve (September – October 1995). "20 Reasons Not to Trust the Journal Editorial Page". Extra!. Fairness and Accuracy in Reporting. Archived from the original on November 7, 2008. Lieberman, Trudy (July – August 1996). "Bartley's Believe It Or Not!". Columbia Journalism Review. Archived from the original on January 29, 2008. ^ Luhby, Tami. "Middle class income rises again — now up to $61,400". Retrieved September 14, 2018. ^ Adamy, Janet; Overberg, Paul (September 13, 2018). "Incomes Rose and Poverty Rate Fell for Third Straight Year, Census Data Show". Retrieved September 14, 2018 – via www.wsj.com. ^ "Real Median Household Income in the United States". September 12, 2018. Retrieved September 14, 2018. ^ "Unpacking WSJ's 'watershed' Trump editorial". Columbia Journalism Review. Retrieved January 1, 2019. ^ Carr, David (December 13, 2009). "The Media Equation: Under Murdoch, Tilting Rightward at The Journal". The New York Times. Archived from the original on February 23, 2017. ^ Rutenberg, Jim (June 3, 2007). "The editorial page commonly publishes pieces by U.S. and world leaders in academia, business, government and politics". The New York Times. Archived from the original on May 13, 2011. Retrieved June 5, 2011. ^ "Big Solar's Subsidy Bubble". The Wall Street Journal. August 30, 2015. Archived from the original on April 2, 2017. ^ "Obama's Tide of War". The Wall Street Journal. October 19, 2016. Archived from the original on April 2, 2017. Retrieved April 24, 2017. ^ "Obama's Iran Missile War". The Wall Street Journal. October 13, 2016. Archived from the original on April 2, 2017. Retrieved April 24, 2017. ^ "Democrats, Russians and the FBI". ^ a b "Wall Street Journal editorial board calls on special counsel Robert Mueller to resign again". Business Insider. Retrieved July 24, 2018. ^ a b Frej, Willa (December 5, 2017). "Wall Street Journal Editorial Board Goes To Bat Against FBI And Robert Mueller For Trump". Huffington Post. Retrieved July 24, 2018. ^ Pompeo, Joe. ""A Different Level of Crazy": Inside The Wall Street Journal's Civil War". The Hive. Retrieved July 24, 2018. ^ Shaun W. Elsasser, Riley E. Dunlap: Leading Voices in the Denier Choir: Conservative Columnists' Dismissal of Global Warming and Denigration of Climate Science. American Behavioral Scientist 57, No. 6, 2013, 754–776, doi:10.1177/0002764212469800. ^ Karen Akerlof et al. : Communication of climate projections in US media amid politicization of model science. Nature Climate Change 2, 2012, 648–654 doi:10.1038/nclimate1542. ^ Cook, J.; Nuccitelli, D.; Green, S. A.; Richardson, M.; Winkler, B. R.; Painting, R.; Way, R.; Jacobs, P.; Skuce, A. (2013). "Quantifying the consensus on anthropogenic global warming in the scientific literature". Environmental Research Letters. 8 (2): 024024. doi:10.1088/1748-9326/8/2/024024. ^ Supran, Geoffrey; Oreskes, Naomi (2017). "Assessing ExxonMobil's climate change communications (1977–2014)". Environmental Research Letters. 12 (8): 084019. doi:10.1088/1748-9326/aa815f. ^ Powell, James Lawrence (2011). The Inquisition of Climate Science. Columbia University Press. ISBN 9780231527842. ^ Lauren Feldman et al. : Polarizing news? Representations of threat and efficacy in leading US newspapers' coverage of climate change. Public Understanding of Science 2015, doi:10.1177/0963662515595348. ^ "The Wall Street Journal articles analyzed". Climate Feedback. Retrieved December 28, 2018. ^ "Wall Street Journal accepts environmentalist ad but charges extra". The Washington Post. June 14, 2016. Archived from the original on June 15, 2016. Retrieved June 17, 2016. ^ a b "The Wall Street Journal: Dismissing Environmental Threats Since 1976". Media Matters for America. August 1, 2012. Retrieved January 1, 2019. ^ Bayer, Ronald; Colgrove, James (2002). "Science, Politics, and Ideology in the Campaign Against Environmental Tobacco Smoke". American Journal of Public Health. 92 (6): 949–954. doi:10.2105/AJPH.92.6.949. ISSN 0090-0036. PMC 1447493. PMID 12036788. ^ "News Corp.-Dow Jones finally a done deal - Aug. 1, 2007". money.cnn.com. Retrieved January 1, 2019. ^ Groseclose, T.; Milyo, J. (2005). "A Measure of Media Bias". The Quarterly Journal of Economics. 120 (4): 1191. doi:10.1162/003355305775097542. ^ Liberman, Mark (December 22, 2005). "Linguistics, Politics, Mathematics". Language Log. Archived from the original on September 10, 2006. Retrieved November 6, 2006. ^ Shafer, Jack (May 7, 2007). "The Murdoch Street Journal". Slate. Archived from the original on September 18, 2008. Retrieved September 7, 2008. ^ "A New Owner". The Wall Street Journal. August 1, 2007. Archived from the original on June 25, 2009. Retrieved September 7, 2008. ^ "The Pulitzer Prizes". Archived from the original on September 25, 2006. ^ Sanford, David. "Back to the Future: One Man's AIDS Tale Shows How Quickly Epidemic Has Turned Archived June 30, 2007, at the Wayback Machine". The Wall Street Journal (New York), November 8, 1997. ^ Gladwell, Malcolm. "Open Secrets Archived September 29, 2007, at the Wayback Machine". The New Yorker, January 8, 2007. ^ "Raymond Snoddy on Media: Logic says WSJ is safe with Murdoch". Mediaweek.co.uk. June 6, 2007. Archived from the original on December 22, 2012. Retrieved June 5, 2011. ^ a b Bussey, John. "The Eye of the Storm: One Journey Through Desperation and Chaos Archived May 11, 2011, at the Wayback Machine". The Wall Street Journal, page A1, September 12, 2001. Retrieved August 8, 2007. ^ "The Pulitzer Prizes – Works". pulitzer.org. Archived from the original on December 30, 2010. ^ Cullison, Alan, and Andrew Higgins. "Forgotten Computer Reveals Thinking Behind Four Years of Al Qaeda Doings". The Wall Street Journal (New York), December 31, 2001. ^ "The Pulitzer Prizes – The Medal". The Pulitzer Prizes. Archived from the original on October 27, 2013. Retrieved October 29, 2013. ^ Ademy, Janet (September 30, 2010). "McDonald's May Drop Health Plan". The Wall Street Journal. Archived from the original on October 4, 2010. Retrieved September 30, 2010. ^ Arnall, Daniel (September 30, 2010). "McDonald's Fights Back Against Report It Will Drop Health Care Plan". ABC News. Archived from the original on October 2, 2010. Retrieved September 30, 2010. ^ Fulton, April (September 30, 2010). "McDonald's threatens to cut skimpy health plans". National Public Radio. Archived from the original on October 1, 2010. Retrieved September 30, 2010. ^ Pequent, Julian (September 30, 2010). "Health secretary says McDonald's not dropping health plans". The Hill. Archived from the original on October 3, 2010. Retrieved September 30, 2010. ^ Weisenthal, Joe (September 30, 2010). "The WSJ's Demonization Of Obamacare Hits New Low With Article On McDonald's Dropping Coverage". Business Insider. Archived from the original on October 2, 2010. Retrieved September 30, 2010. ^ Jason Ng (July 7, 2015). "Malaysia Orders Freeze of Accounts Tied to Probe of Alleged Transfers to Prime Minister Najib". The Wall Street Journal. Archived from the original on April 23, 2017. ^ Carreyrou, John (October 16, 2015). "Hot Startup Theranos Has Struggled With Its Blood-Test Technology". The Wall Street Journal. ISSN 0099-9660. Archived from the original on April 21, 2017. Retrieved April 22, 2017. ^ a b Bilton, Nick. "Exclusive: How Elizabeth Holmes's House of Cards Came Tumbling Down". The Hive. Archived from the original on April 10, 2017. Retrieved April 22, 2017. ^ "Are The Wall Street Journal's Allegations About Theranos True". Fortune. Archived from the original on January 11, 2017. Retrieved April 22, 2017. ^ Weaver, Christopher; Carreyrou, John (January 18, 2017). "Second Theranos Lab Failed U.S. Inspection". The Wall Street Journal. ISSN 0099-9660. Archived from the original on April 21, 2017. Retrieved April 22, 2017. ^ Weaver, Christopher (April 22, 2017). "Theranos Secretly Bought Outside Lab Gear, Ran Fake Tests: Court Filings". The Wall Street Journal. ISSN 0099-9660. Archived from the original on April 21, 2017. Retrieved April 22, 2017. ^ O'Brien, Sarah Ashley. "Elizabeth Holmes indicted on wire fraud charges, steps down from Theranos". CNN.com. CNN. Retrieved June 15, 2018. ^ "Rupert Murdoch set to lose $100m Theranos investment e". The Guardian. Retrieved April 14, 2019. ^ "Timeline of the Donald Trump-Stormy Daniels Saga". Wall Street Journal. May 3, 2018. Retrieved April 8, 2019. ^ Mangan, Dan (December 12, 2018). "Trump's ex-lawyer and fixer Michael Cohen sentenced to 3 years in prison after admitting 'blind loyalty' led him to cover up president's 'dirty deeds'". CNBC. Retrieved April 8, 2019. ^ Grynbaum, Michael M. (April 16, 2019). "Pulitzer Prizes Focus on Coverage of Trump Finances and Parkland Shooting". New York Times. Retrieved April 16, 2019. Dealy, Francis X. The power and the money: Inside the Wall Street Journal (Birch Lane Press, 1993). Douai, Aziz, and Terry Wu. "News as business: the global financial crisis and Occupy movement in the Wall Street Journal." Journal of International Communication 20.2 (2014): 148-167. Steinbock, Dan. "Building dynamic capabilities: The Wall Street Journal interactive edition: A successful online subscription model (1993–2000)." International Journal on Media Management 2.3-4 (2000): 178-194. Wikimedia Commons has media related to The Wall Street Journal.